Last season’s League Two ended up being dominated by Paulo Di Canio’s Swindon Town with some other surprising names making up the chasing pack, whilst traditional big hitters like Bradford and Rotherham struggled to make an impact. The transfer of Nick Powell to Manchester United and Jack Butland’s call-up for England’s Euro 2012 squad shows there is plenty of talent in the Football League’s basement division and 2012/13 is shaping up to be a very competitive season. The team of the season is a 4-4-2 formation and again comprises just one player per club. 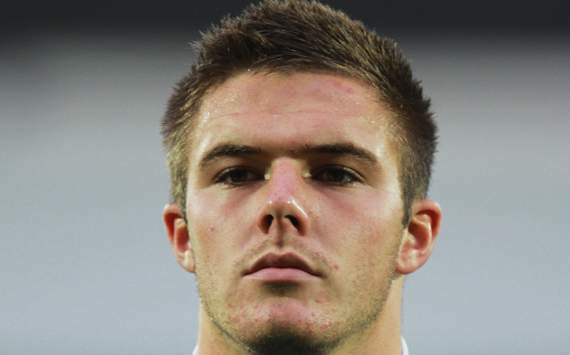 Seeing as Butland has yet to make a senior appearance for parent club Birmingham City, it was his performances on loan at Cheltenham that caught the eye of England Under-21 coach Stuart Pearce and eventually top man Roy Hodgson. Butland was the rock on which the Robins’ defensive displays depended and he impressed with his commanding displays and giant frame. A real coup for the U’s, right back Andrew Whing arrived at Oxford following a short spell at Leyton Orient but it best known for four-year spells at Coventry and Brighton respectively. A real model of the modern full-back, Whing is a powerful runner, strong in the tackle and good in the air and he immediately cemented his place in the Oxford first team for the 11/12 season. The big centre-half made the step up from the Conference superbly and was a real rock at the back for the Reds as they won a second successive promotion. The former Sheffield United youngster is excellent in the air and times his tackles well. Was the subject of interest from Bolton in the January transfer window. There was no surprise when new Rotherham manager Steve Evans made Ian Sharps one of his first captures in the transfer market. Sharps has been a stalwart of the lower leagues for a number of seasons and impressed in his first spell with the Millers. Led Shrewsbury to promotion last season with some commanding displays. Appointed captain at new club Gillingham, Andy Frampton is another player who has impressed in the Football League for a number of seasons, most notably with Brentford and Millwall. He posseses an excellent left foot and has the height to cope with an aerial threat. It remains a mystery why winger Matt Ritchie has spent most of his seasons in the lower leagues, rather than in the Portsmouth first team when they were further up the football pyramid. Deployed as a right winger cutting inside by manager Di Canio, Ritchie excellent and lit up League Two with some spectacular strikes. One of England’s brightest young hopes, Nick Powell is the latest name off the Crewe Alexandra supply line. A tremendously energetic box-to-box player with an eye for goal, Nick reached double figures in the campaign and his reputation was enhanced by the goal that clinched the League Two Play Offs for the Railwaymen in May. In 2010, Southend manager Paul Sturrock took a real gamble on former Bromley midfielder Ryan Hall but the ex-Crystal Palace youngster has repaid the faith with some fine performances last season. Ryan netted 14 goals during the campaign as the Shrimpers reached the play offs. A long-serving member of the Torquay squad, winger Lee Mansell showcased some his best form last season as the Gulls reached the play offs. A skillful footballer who has a habit of gliding past opposing defenders, Lee scored some spectacular goals among the 13 he netted over the course of the campaign. It is fair to say that had it not been for the 22 goals of Izale McLeod then Barnet would have started their 2012/13 season in the Blue Square Bet Premier last week. McLeod put years of injury frustration behind him to excel at Underhill, where he was the focal point of the team; his unerring finishing a delight to watch. How the Bees cope without him this season remains to be seen. The big striker has turned into one of League Two’s most prolific marksmen, after scoring 50 goals in the previous three seasons for Gillingham and Northampton. Returning to Sixhills, Akinfenwa was in similarly good scoring form for the Cobblers last term. Like McLeod before him, Northampton fans will wonder where there side might have ended up had it not been for the burly forward.